Tributes from all corners of the music industry have appeared remembering the life and career of Phil Everly, who died at the weekend after a lengthy battle with lung cancer aged 74. Praise from from the likes of Brian Wilson, Paul Simon, Iggy Pop and many more has born testament to the incalculable impact of the Everly Brothers' music. As perhaps the greatest harmony singers popular music has ever seen, the Everly Brothers had a significant impact on the young Lennon and McCartney - an influence that can be heard throughout The Beatles' career. Indeed, wherever close harmonies appear, from the likes of Simon & Garfunkel and The Hollies to the Proclaimers, the legacy of the Everlys can be heard. At the peak of their success, the Everly Brothers' harmonies and melodic instincts dominated the charts, with early hits on the Cadence label including Bye Bye Love, Wake Up Little Suzie, When Will I Be Loved and All I Have To Do Is Dream now regarded as classics of the pop canon. They even had a signature acoustic guitar: the Gibson Everly Brothers Flatop was a jumbo acoustic with an outsized pickguard and star fret markers that become a visual trademark of the brothers. 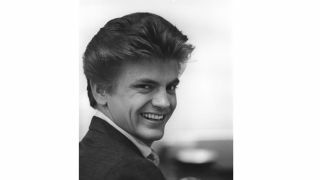 Below are just some of the tributes to Phil Everly, but first we suggest you check out this astonishing live footage of the Everly Brothers performing live in 1957. Don Everly, Associated Press: "I loved my brother very much. I always thought I'd be the one to go first. I was listening to one of my favorite songs that Phil wrote and had an extreme emotional moment just before I got the news of his passing. I took that as a special spiritual message from Phil saying good-bye. Our love was and will always be deeper than any earthly differences we might have had. The world might be mourning an Everly Brother, but I'm mourning my brother Phil Everly. My wife Adela and I are touched by all the tributes we're seeing for Phil and we thank you for allowing us to grieve in private at this incredibly difficult time." Paul Simon: "Phil and Don were the most beautiful sounding duo I ever heard. Both voices pristine and soulful. The Everlys were there at the crossroads of country and R&B. They witnessed and were part of the birth of rock and roll. I loved them both. Phil was outgoing, gregarious and very funny. Don is quiet and introspective. When Simon and Garfunkel toured with the Everlys in 2003, Art and I would take the opportunity to learn about the roots of rock and roll from these two great historians. It was a pleasure to spend time in their company." Brian May (via brianmay.com): " I feel like a huge piece of my youth just melted away. I loved, loved those guys, and still do. From the Everly Brothers I learned to play rhythm guitar (a lot of people don't have that experience these days), and I learned every note of both parts they sang - normally Phil taking the top part and Don the lower. "From this I learned how two-part harmonies work - how different emotions are evoked using different sequences of intervals, how to find the moments that chill your spine, and avoid the 'easy' too-sweet harmonies that would make it sound trite. I know for sure that The Beatles learned a lot from the Everlies too - they too had a powerful innate understanding of how these things could be made to work (I knew it the first time I heard 'Love Me Do' on the radio - and compare the wonderful diverging harmonies of Please Please Me with the Everlies' Cathy's Clown)." Iggy Pop (via facebook): "God bless Phil Everly. The Everlys were the real deal when it comes to American music. I saw them in the 60s at the 20 Grand in Detroit, and they seriously rocked the huge house, with just two Gibson Jumbos, and their voices. And man, did these guys have cool haircuts. I bought 'Songs our Daddy Taught Us' on download recently and there's a whole life lesson in there. It's brothers like the Everlys, that make the music scene of today worth bothering with. I am in their debt like so many others, for they have enriched my life. Iggy"
Billie Joe Armstrong (via twitter): "The Everly Brothers go way back far as I can remember hearing music. Those harmonies live on forever. We're gonna miss you Phil. Gratitude." Norah Jones: "The Everlys had a huge influence on all kinds of musicians. The high harmonies Phil sang were fluid and so beautiful and always sound effortless in a way that just washes over the listener. He was one of our greats and it's very sad to lose him." Carole King (via twitter): "So sad to lose Phil Everly. Deeest condolences to his family." M Ward (via twitter): "r.i.p. phil everly. made the world a better place"
Albert Lee (via the BBC): "There was nothing like it. It was a combination of their country upbringing and when they became teenagers they fell in love with rock and roll,"
Brian Wilson (via twitter): "My heart is so saddened by the passing of Phil Everly. I could never get enough of the Everly Bros voices. Love & Mercy to family & friends." Billy Bragg, (via Facebook): "Sorry to hear of the death of Phil Everly of The Everly Brothers This album of classic American folk ballads [Songs Our Daddy Taught Us] is one of my most treasured records, providing the missing link between two of my favourite artists - the Louvin Brothers and Simon & Garfunkel. Beware modern imitations!!" Rob Lowe, (via twitter): "Hearing Phil Everly's harmonies was transcendent. Wrote "Love Hurts" as a TEENAGER! Goodbye to a master." Nancy Sinatra, (via twitter): "Phil Everly is gone. Touring with Phil and Don was one of the thrills of my life. I love you Phillip - Godspeed"